My computer would not cooperate over the weekend. I lost ALL of my files, documents, and photos. Even though I had anti-virus, anti-spam, anti-everything software. I quickly learned what was really important to me. Did I have back up? Yes. But the last time I backed anything up was a year ago. So, essentially, I lost a year of....stuff. I had a good, ugly cry. It lasted a couple of minutes. I came to my senses and realized what I was really grateful for. My taxes were done and printed. Not filed, but printed. My 21 year old son is computer savvy. He downloaded a data recovery program and was able to retrieve most, but not all of my photos and documents. See this photo? It's my new pastry brush. Only the photo is corrupted. My documents? The first 20 pages of my journal were salvaged. Not the rest. It was scrambled...corrupted. I realized that the "missing" or "corrupted" pages were really a documentation of the crappy parts of last year: My mother-in-law's diagnosis, struggle, and death from ALS (Lou Gehrig's Disease). How my oldest son just up and left our home three days after her diagnosis. No explanation. No answers. Did I really need that reminder? I have often said that I NEVER wanted a repeat of last year again. It was probably a good thing that those pages from my journal are gone. I embraced the new year, looking forward, being grateful for the lessons and the strength that I gathered from my experiences. The new year began with my son returning home. Yes, the tech savvy kid who tried to salvage my stuff on the computer. What would I have done without him? I'm grateful for every day that he is here. I know that he is safe and that he is okay. The anniversary of my mother-in-law's death is approaching. It has been difficult adjusting to the changes of her being gone, but what have I learned? To remember and say, "I love you" on a daily basis. To appreciate being able to walk, brush my own teeth, dress myself, and breathe. To appreciate being able to do something for someone else and the joy that results from it. You know what else I loved about last year? The world of blogging. I get to share what I love, what I do, with friends from all over. Old friends, new friends, and online friends. It amazes me the wealth of information that I have learned from folks all over the world. I love to leave comments and read the comments that are left on my blog. I love being able to help someone across the U.S. make a successful loaf of bread or a light, buttery roll. Gadgets that serve more than one purpose. Gadgets that don't take up a whole lot of space. Gadgets that are inexpensive. See this pastry brush on the left? It's worse than my toothbrush...it needed replacing! I searched high and low to find the PERFECT pastry brush...and here it is! 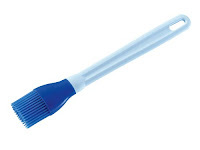 A Lurch Silicone Pastry Brush. I tried to find one that had bristles that were just right...not too long and....flippy. I needed a sturdy brush that I could dip into shortening or butter to brush my loaf pans. There is a bonus...it is made from silicone and is heat resistant up to a ridiculous temperature. I used it in hot bacon grease to grease my muffin tins for corn muffins. Yum! Do you want one? I know you do! A bowl scraper. This is another one of my all time favorite gadgets. The curved end scrapes any kind of dough or batter out of a bowl and into a pan or counter top. The flat end scrapes anything off your counter...without scratching. It's not too big, not too small, and is flexible. Leave a comment telling me what you are grateful for and invite a friend to subscribe/follow my blog. (Comment + I have invited....Sarah L.) You don't have to invite a friend, but the more, the merrier! If you are chosen by Random.org, you AND your subscribed friend listed on the comment will each receive both of these great gadgets. You can leave one comment per day. Wow....every day, you can invite someone new! This giveaway is open to U.S. residents only and will end at midnight Tuesday, February 23. I am so grateful for my husband and friends who willingly and lovingly try my new recipes :] I have invited Sarah M.
First of all, I don't have a clue why I wasn't listed in your followers because I've been following your blog forever. I guess I've been following through my Google reader and just never noticed that I didn't show up on your "follow me" thingie. What a lovely post Frieda. I'm sorry about your computer crash. I've had it happen too and lost so many valuable pictures. I'm so happy that your son is back with you and that he's a computer geek! I'm going to refer June from JBug's Kitchen Antics to your blog. I am grateful for my children. They are three and one, and they bring great joy to my life--every day! I'm so sorry about your computer headaches! After I lost my hard drive a year ago I signed up with http://mozy.com/ and my files are automatically backed up every night. It's pretty inexpensive and so worth it! I'm grateful to have it. I'll refer Cristie, The Table Runner to your site. Frieda... I'm so sorry for what happened! My hard drive crashed on me, a few years ago, and I lost a lot of valuable stuff. My Computer IT wizard (my hubs) has me backing up on a regular basis. He never could recover my lost files. Ouch! Your blog deserves a lot more recognition-- I discovered you early on and have followed you faithfully. I'm a kitchen gadget addict, myself. I'm looking for a good pastry brush-- win or not, I must get one. I'm going to refer my friend, Monica, from Lick the Bowl Good. Here's to brighter days, and joy. Ooops-- what am I grateful for? My God, my husband, my friends and being richly blessed in being able to eat whatever I want, whenever I want and to blog it and meet new friends. I have visited your blog several times and love it! Barbara of BarbaraBakes directed me here tonight and my goodness what a terrible thing to have happened to your computer. I had to get a new hard drive in 2009 and it was a mess recovering all the data even with my son who is also a wiz at all things computer. I will be inviting Bonnie of City Home/Country Home to see your beautiful site. I need a good silicone brush. Mine is veerrry flippy...so annoying. I invited my friend Lori T.
I was so touched by your post today. I have one close friend who died from AlS two years ago and another in the last stages now. It is a horrible disease and having seen it very close up, I am so grateful for my healthe and that of my family. Cristie referred me. Someone else in my life whom I am grateful for. Here's wishing you a better year. Our computer died in December and we only just got all our data back, luckily it all made it, whew! The computer repair shop said they couldn't, but my uncle and cousin were able to get it! Having experiences like this make you want to shout: Back up your data! Of course besides the journal, and pictures it also had my husband's in progress thesis. Hi Frieda - so sorry you've joined the "computer woe club". Me too not that long ago, but I'm happy that you're back up and running. Mags recommended your site to me and I'm just going to sit here with a coffee and enjoy! I was referred by my sister Sara N., whose blogger id will appear as Tigger when she comments. (I think). I did come over a few times from the Fab Frugal Food giveaway from your delightful tips. Sara loves your site and talks about it a LOT. I am grateful for all of the mad kitchen skillz I have gained from reading blogs and googling. I am grateful for family. My family is great and I love them loads. I'm going to refer my sister Mary. I'd love to have a pastry brush. I use one of Husband's old paintbrushes (that is WELL cleaned) and he really doesn't like it. I've referred Jonix. I'm thankful for my great kitchen that I can make all of my creations in! I'm going to refer Scott K from Fight the Fat Foodie. I can't believe you only cried for a few minutes! I'm grateful for my new job! I applied last year - and I invited Pamela. I just had to leave a comment - I went through TWO computer crashes last year - and shed many tears in the process. Glad to hear that this year is shaping up for you better than last year. I recently tried and liked your recipe for baking taco shells over the oven racks - cool, thanks! I love your blog and have referred my sister, Jackie Fail. Sorry to hear of the computer troubles. Reminds me I need to back up my photos! I found your blog on Mags from The Other Side of 50's blog. Sorry about your computor!! I don't down load,or let those up dates,do their thang,these computors are so touchy.I let my daughter look at my problems,and I may be gone,for a month,but I have lost it all,because,it said you need this,ok,and its all gone!! Here's hoping entry #2 will be my winning entry. I really could use that brush. Thanks for the giveaway. I just found your site and I love it! Fun giveaway, too! I am supremely grateful for a loving family that supports me unconditionally. I've invited my newlywed niece, Stephanie C, a cook-in-training who will enjoy your recipes. Sorry about your computer woes. Hope all is back to normal soon! I'm grateful for being into my 2nd year of marriage! The first year was very rough and like you.. I don't want to relive it. Now that we're in our 2nd year.. we know what to do to stay on each other's good side, and we know what to do to push each other's buttons! I was referred by Suzitravel! New day,new entry. Hoping to win. Fingers crossed! Can I enter this giveaway just by leaving a comment? Sometimes I can't remember details from day to day. Darn! I have been wasting days this week. I should have left a comment everyday! I did tell another one of my friends about your blog. I don't know if she has checked it out. She wanted to know a little more about Dough Enhancer. I told her what I read on your blog, then I gave her the URL for your blog. Freida, you are great! Thanks for sharing all your advice.